The Golden Image Award is in Honor of Her Excellency Ellen Johnson-Sirleaf, President of the Republic of Liberia, whose leadership quality is attributable to the following thoughts: "Leadership is an action, not a position." This is more than apparent throughout Africa. Though many seek the position, few provide the action. "Peace is not something you wish for; it's something you make, something you do, something you are, and something you give away." Every year the GIA is held, it will be held in her honor. This is because of her bold and courageous role played in Liberia's political struggles and relentless campaign against bad governance. Her Excellency Ellen Johnson Sirleaf being the image behind the Award is in no uncertain term a mistake given that she got elected as Africa's first female democratically elected head of state. 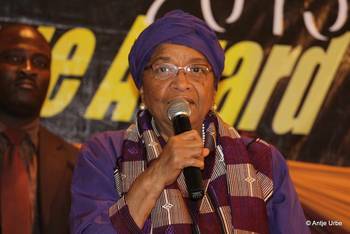 Undoubtedly, President Ellen Johnson Sirleaf is an, international icon, a Nobel Peace Prize Laureate, recognized as a leading promoter of peace, justice, and democratic rule. As the first female president of Africa, the Liberian leader is witty, strong, determined and imbued with personal integrity and commitment to ethical reform for the people of Liberia.